All transactions are safe and secure with a reliable history in online purchasing behind each of our associates. 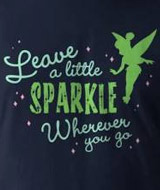 Buy the Leave a Little Sparkle Tinkerbell t-shirt to own Peter Pan clothing and merchandise. "Leave a little sparkle wherever you go." This Tinkerbell tee will have you believing in fairies all over again. The design on this Peter Pan shirt features J. M. Barrie's memorable Tink letting her own fairy dust sparkle. Pick your clothing color and style. Then let your own fairy dust sparkle by letting your personality shine. In addition to the Leave a Little Sparkle Tinkerbell tee above, browse the Peter Pan Clothing Gallery for more apparel like men's and women's clothes, kids shirts or hoodies.